APIs: What they are and why they matter to digital humanities? With a focus on digital humanities, of course. Please talk to me this weekend and after the workshop. APIs are "application programming interfaces". Note: There are many different types of APIs (e.g., operating system APIs, including the Windows API, Mac OS X APIs, Linux APIs, iOS, Android APIs), programming language and framework APIs (e.g., Java library), we'll put most of our focus on web APIs. My prediction: every site of significance will eventually have an API. APIs allow you to leverage existing assets —yours and others'. By letting others access some your data and functionality through APIs, you increase the value of your data and services by enabling others to rely on you in new, creative, and profitable ways. Moreover, you can prototype and build powerful applications faster because you can reuse data and code from other people's websites. The value of your data, when it is scattered throughout multiple databases and applications, grows if you can make it all work together. This value increases further when you leverage your information resources with the vast world of data on the Web. APIs can help you integrate data across your organization and beyond. How often do you wish that you could make all the different parts of your digital world—your e-mail, your word processor documents, your photos, your search results, your maps, your presentations—work together more seamlessly? After all, it’s all digital and malleable information—shouldn’t it all just fit together? See Chapter 6 of my book for a fuller explanation. See Stats about Flickr photos (Google Spreadsheet) for an example of using the Flickr API inside of Google spreadsheet to tally the number of public photos by license available to the API. Flickr Services lists some mashups using the Flickr API including Flickr Sudoku, Flickr Postcards and fd's Flickr Toys: Do fun stuff with your photos. One of my favorite Flickr mashups is two ways in which Picnik interacts with Flickr: a) Flickr's photo-editing functionality uses Picknik's API and b) you can edit Flickr photos in Picnik (via Flickr's API). So what to do now? Interestingly enough, someone just announced a JSON feed service for a given wishlist, for example, Jeff Bezos' wishlist and mine (in JSON). I hope it stays around. How does it work given the demise of the ListLookup operation? My guess is that some sort of screen-scraping is going on. Things to consider: the long-term sustainability of APIs, the business case for creating an API in the first place. Sometimes APIs, even from big companies die. Another example: I'm not the only person sad about the death of the Google Maps Data API. ProgrammableWeb lists APIs and mashups that use these APIs. Google: The Maps API is responsible for the proliferation of Google's maps to tens of thousands of websites. With the popularity of the Maps API, Google began offering APIs to many more of its offerings, including YouTube, Google Search, Documents, AdSense, Calendar, and App Engine. Facebook: Facebook Apps, driven by the website's API, enhances Facebook's standing as one of the central online social networking platforms. Yahoo! : APIs, which are central to the Yahoo! Open Strategy (YOS), to "deliver open, industry-leading platforms that attract the most publishers and developers", provide access to such services as Flickr, Yahoo! Search, Maps, Local listings. Yahoo! also created Pipes and YQL to let developers program more easily with APIs. Microsoft: Not to be outdone by Google, Microsoft is building Windows Azure, a large set of APIs to services hosted on its servers. Salesforce parlayed its customer relationship management system into a major business platform via its APIs. The New York Times provides an API to give access to millions of its articles dating back about three decades. Etsy, a site for artists to sell handmade goods, released an API to officially bless work by third party developers who had been driving useful traffic to Etsy. Twitter has built an empire of third-party services that uses its API; the traffic to the API is an order of magnitude greater than that to its own regular website. OCLC, a major library consortium,provides access to the records of its WorldCat catalog via an API. WordPress: Every installation of the popular open source weblogging software, ships with a built-in API, resulting in thousands of websites with APIs that can be used right away. This talk will be similar to one I gave at the Library of Congress: Web 2.0 Mashups: Making the Web Your Own Webcast (Library of Congress). For a highly readable article on how companies get into creating APIs to enable mashups, read How to Manage Volunteer Software Developers, Managing Technology Article - Inc. Article -- it's the story of how cutting-edge usage of Etsy prompted Etsy to hire Mashery to build an API. Pick any two API (starting with services you are familiar with and then migrating to random ones) and brainstorm mashups using these APIs. You can use the list of APIs at ProgrammableWeb and do an advanced search on ProgrammableWeb for a particular combination of APIs. We'll do this in a large group first and then we'll be working in smaller groups to have more discussion. Now we take a problem that you want to solve (a fanciful problem or one that you are wrestling with in your own work) – come up with the APIs that would be useful to help you solve that problem. Do those APIs exist? If not, what would it take to make those APIs? Making everything connect seamlessly with minimal and elegant ease: Can this happen? How? Raymond Yee is President of Data Unbound LLC. 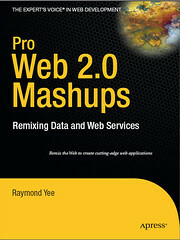 He is author of the leading book on web mashups, Pro Web 2.0 Mashups: Remixing Data and Web Services (Apress). He has been a contributing writer for ProgrammableWeb, the web's premiere resource for tracking developments in APIs and mashups. At the UC Berkeley School of Information, he taught Mixing and Remixing Information, a course on using APIs to create mashups. He has co-written three influential reports on how the US government can improve its efforts to make data and services available through APIs. Raymond served as the Integration Advisor for the Zotero Project (a widely used open source research tool) and managed the Zotero Commons, a collaboration between George Mason University and the Internet Archive. As the Technology Architect for the Interactive University Project at UC Berkeley, he designed and prototyped software to support learning, teaching, and research, in collaboration with the California Digital Library. As a campus data architect, Raymond led the technical development of a faculty advancement reporting system. Raymond is an erstwhile tubaist, admirer of J. S. Bach, Presbyterian elder, aspiring essayist, son of industrious Chinese-Canadian restaurateurs, and devoted husband of the incomparable Laura.